Mobatek wrote: By the way, if you want to update the screenshot on the software page, you can use this one. Updating the screenshot is not much effort at all, so I updated it. Ooops, we have been told that the SSH gateway (which allows users to connect to a remote server through an intermediate SSH host) is not working on recent version 7.5. We just released a bugfix version (7.6) in order to correct this error. Could you please advise me about the right command? I am sorry, I do not understand the question: the command you wrote seems to be a script which is launched on your remote server, not in MobaXterm. @j.tomsic : this is not implemented in MobaXterm but this may be an interesting feature. We will work on it for a future release of MobaXterm, thanks! which includes in its output the BGP AS number (Autonomous System) for each hop traversed ? Thanks for considering the feasability of this request. Unfortunately, this one is harder to implement because it seems to require admin rights in order to forge network packets. Anyway, we are trying to find the most convenient way to implement this for an upcoming release of MobaXterm. We just released MobaXterm version 8.0. In this release, we worked on adding credentials support for SSH, RDP and SFTP sessions, we also changed the terminal and SSH component to a native and much faster one (based on PuTTY by Simon Tatham) and the embedded X server is now much faster (compiled as a native Windows program). We also tried to put a new "Welcome page" in the software: we hope you will enjoy it! 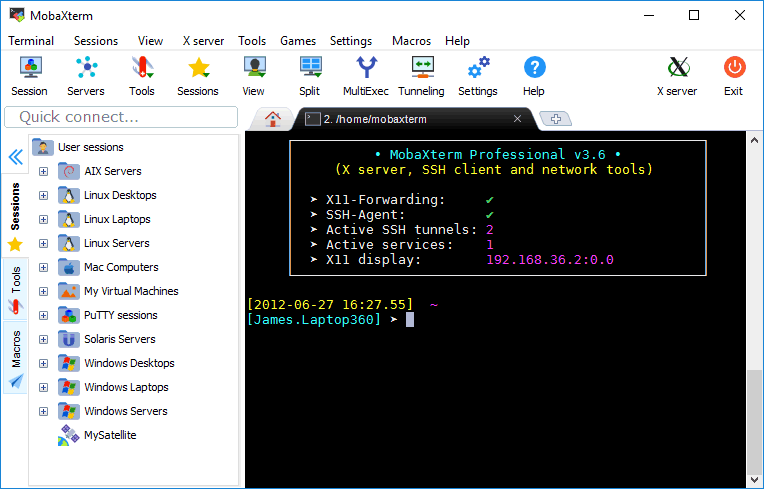 - New feature: Added a "home page" at MobaXterm startup with recent sessions, a quick search bar and a button to start a new terminal. You can disable this home page from the global settings and choose to start a local terminal instead. Thank you. I have updated the entry.